As certified a pizza fanatic that I am, I know for a fact that Greenwich's favorite pizza and pastas bring friends together. And when the meal is over and it's time to part, Greenwich leaves no room for bitterness. And guess what, for only P109 (dine-in) , you can have a sweet ending to every meal especially on this sweetest month of the year with Greenwich's all-new Choco Banana Crisp, a 9-inch dessert pie made with bananas, chocolate, and your favorite Italian cream, Nutella. This crispy and tasty dessert is designed to be shared, so grab your barkada and visit the nearest Greenwich`s store to enjoy the #ChocoBananaCrisp. 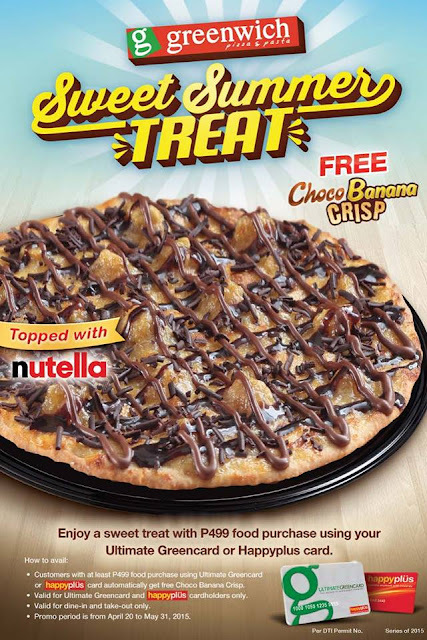 You may also want to avail of this latest promo below to satisfy your cravings for a sweet choco banana treat!! So mouthwatering I didn't know that Greenwich serve a desert like this now I know. Very nice presentation and the price is affordable too. Looks so delicious, males me want to get up and get something to eat! oh i miss Greenwich, the flavor they have is just good, nothing beats the kind of pizza they make. That looks really good! The sweet tooth in me had awakened when I saw this. I need to try it. Yummy indeed! that taste like heaven to me. Yes, this is a great pizza to try. Gora na sa Greenwich this weekend.